If you've recently started heating with wood, you have probably discovered that splitting wood by hand is hard work and, well, not all that fun. You may have started to do some research into log splitters, and come upon the Champion 90720 7-ton splitter as a possible purchase. Is it the right choice for you? 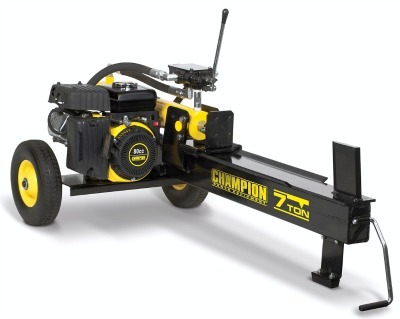 Read on - we've assembled all the important information you need to decide that here in our comprehensive Champion 7 ton log splitter review. Max. Log Length: 20 in. Max log weight: 100 lbs. *Note: specs on Amazon do not all match those on Champion website. We have listed here the specs from the Champion website, assuming those to be more reliable. For example, Amazon says the pump is 2 GPM at 3900 PSI, but Champion says it is 3 GPM with a max. PSI of 3,000. Champion Power Equipment has only been in business since 2003. However, since that time it has acquired a great reputation particularly for its generators. Based in California, it also has facilities in Wisconsin, Tennessee, and Toronto. It appears to do most of its manufacturing in China. The engine on this splitter is made by Champion. It has an 80cc displacement and is a typical OHV 4-stroke engine. Champion does not say what the horsepower or torque for this engine is. The model number is YF152F-2-000. Compared to Honda and Briggs & Stratton, the Champion engines do not have a following of fans. However, reviews by owners of this and other Champion log splitters turned up very few complaints about the engines. In fact, many owners reported they reliably start on the first pull. It is important that the gasoline used be 85+ octane and less than 10% ethanol. Gasoline blends with ethanol absorb more water than plain gasoline. This can cause sticky residue in the fuel tank, valves, and carburetor and shorten the useful life of the engine. Fuel stabilizers can help with this problem, but be sure to find one that is specifically formulated for use with ethanol blends. The pump on this splitter can move 3 gallons of hydraulic fluid per minute, at a maximum pressure of 3,000 pounds per square inch. The cycle time is a relatively long 20 seconds. However, one person working alone cannot load and unload much faster than that. This is the smallest splitter that Champion sells, and at the low end power-wise of splitters in general. While some users report success using it to split fairly large diameter logs, it is probably most suitable for those 18" and smaller. The 100-pound weight limit on logs is also important to keep in mind. This splitter will not be delivered by Fed Ex or UPS. It will come on a tractor trailer and will take 2 people to unload. The driver will not help. With a shipping weight of around 170 pounds, 2 people should be able to load it onto a pickup after delivery. The splitter comes partly assembled, and will require about 2 hours of additional assembly. Unpacking and assembly will be easier with 2 people, but can be done by one alone. Snap ring pliers are needed for attaching the wheels. The manual has detailed instructions for assembly, with diagrams. This log splitter costs between $600 and $800, including curbside shipping. It is available from Amazon, Home Depot, Rural King and others. It does not appear to be carried by local dealers, but only by larger retailers. Champion offers consumers a 1-year warranty on parts and labor, and a 2-year warranty on parts. For commercial use, the warranty is 90 days (parts & labor) and 180 days (parts). However, with only 7 tons of ram power and a 20-second cycle time, this splitter is not really suitable for commercial use, so the consumer warranty is the one to consider. Especially if you buy a product like a log splitter online, you should consider whether there is a service center near you. Clearly, you are not going to ship it back to the company for repair. You can find out if there is a Champion service center in your area here [http://www.championpowerequipment.com/sales-service/where-to-buy/home-standby/]. It appears to have more service centers in some states than others. This splitter has only 16 reviews on Amazon, but 14 of them are 4 stars and above, and only two of them are one star. Considering that unhappy customers usually post more often than happy ones, this is a pretty good average. It is not clear whether the two 1-star reviewers tried to work with Champion customer service to resolve their problems. One of them said theirs stopped working after 2.5 months and was out of warranty. Unless he was using it for commercial purposes, for which it is really not suited, there should have been at least a one year warranty. Over and above the warranty, Champion offers lifetime technical assistance for their equipment, which might help with troubleshooting an out-of-warranty engine. If you are looking to split a few cord of wood a year and don't tend to have really large logs to work with, The Champion 90720 7-ton log splitter appears to be a good value, as long as there is a service center near you in case warranty service is needed. This splitter cannot be towed, and is limited to horizontal orientation.